"When the weather gets a little colder, this pork stew really hits the spot. Pork shoulder meat is braised in a creme fraiche sauce until amazingly tender and delicious. 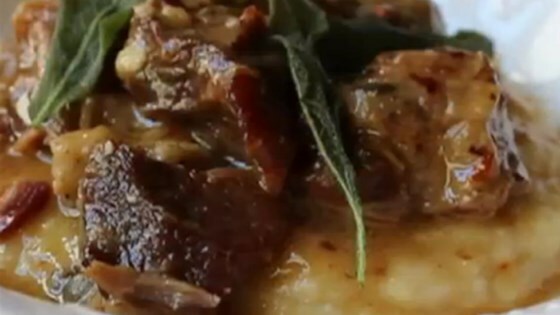 Serve on polenta with crisp sage leaves for garnish." Pork is simmered in crème fraiche and broth until impossibly tender. Serve this with Chef John's Perfect Polenta. It's great as a base for all kinds of saucy meats and stews. This recipe was amazing. We couldnt find creme fraiche or sage in our local grocery store so we used 1/4 Cup of cream and 2 tsp dried poultry seasoning and served with Chef Johns Polenta. This turned out to be a tender and flavorful pork dish. I'm going to rank this in my personal top 5 recipes for sure! Thanks again Chef John.